There are at least a dozen different Theosophical "traditions" or "schools" based on the claims of various prominent individuals in the modern Theosophical Movement. H.P. Blavatsky (1831-1891) was the first person in modern times to write about the Theosophical Adepts, especially the Masters Morya and Koot Hoomi. But after H.P.B. 's death in 1891, we find numerous claims of contact with the same Adepts. See a list of persons making such claims. These various claims are dependent on Mme. Blavatsky's original statements and testimony. For example, if H.P.B. was a fraud, her Masters fictional characters, and her teachings false or simply made up and/or borrowed from genuine previously existing religious and esoteric beliefs, then all the later claims based on hers would also be false. "You cannot acquire psychic power until the causes of psychic debility are removed. . . . You have scarcely learned the elements of self-control in psychism. . . . "
"Your vivid creative fancy [imagination] evokes illusive Gurus and chelas, and puts into their mouths words coined the instant before in the mint of your mind, unknown to yourself." "The false appears as real, as the true, and you have no exact method of detection, since you are yet prone to force your communications to agree with your preconceptions." Letter 17 Bold added. But if H.P.B. 's claims and teachings are true and genuine, that is no guarantee that any of the later claims are therefore true and genuine, too. All later claims might be false. Or only one or only some of the later claims might be true but the rest might be false. Etc. Some Theosophists sided with Mr. Judge; others with Mrs. Besant. This "division" led eventually to the breakup of the original Theosophical Society into two separate and competing organizations. The contradictory claims by Judge and Besant apparently were the beginning of the various lineage claims concerning "esoteric" successors to Madame Blavatsky. H.P. Blavatsky > Annie Besant & Charles W. Leadbeater > the next successor ?? H.P. Blavatsky > William Q. Judge > Katherine A. Tingley > G. de Purucker > the next successor ?? H.P. Blavatsky > William Q. Judge > Robert Crosbie > the next successor ?? H.P. Blavatsky > Alice A. Bailey > the next successor ?? And, of course, there are also many other lineage claims (e.g. those of Helena Roerich, Elizabeth Prophet, etc.). The end result is a confusing morass of claims and counterclaims and various contradictory and conflicting teachings. But should we really be surprised that all of this has happened? "Great are the desecrations to which the names of two of the Masters have been subjected. There is hardly a medium who has not claimed to have seen them. Every bogus swindling Society, for commercial purposes, now claims to be guided and directed by 'Masters' often supposed to be far higher than ours!...." The Key to Theosophy, original edition, p. 301. Italics added. "The publication of many of the facts herein stated has been rendered necessary by the wild and fanciful speculation in which many Theosophists and students of mysticism have indulged...." The Secret Doctrine, original edition, Vol. I, p. viii. Italics added. "... A new and rapidly growing danger...is threatening...the spread of the pure Esoteric Philosophy and knowledge....I allude to those charlatanesque imitations of Occultism and Theosophy....By pandering to the prejudices of people, and especially by adopting the false ideas of a personal God and a personal, carnalized Saviour, as the groundwork of their teaching, the leaders of this 'swindle' (for such it is) are endeavoring to draw men to them and in particular to turn Theosophists from the true path." E.S. Instruction No. I., 1890 edition, p. 2. Italics added. Therefore how should inquirers approach all these claims? What should new students to Theosophy "believe" or think about all these claims? First of all, students of Theosophy might seriously consider the implications of what H.P.B. and her Masters wrote about these false claims and pseudo-Theosophical teachings when they are evaluating the validity of the later claims occurring after 1891. (2) try to determine what is what, whose claim or teaching is valid, true or false, etc.?? Of course, some Theosophical students say that they don't need to do such a laborious task as outlined in the last paragraph. They say they have "intuitions" and those intuitions are all they need to find the truth in these matters. Others apparently don't even care what is "true" or "false" or may even question the labels "true" and "false". Other seekers may simply "pick and choose" what they "feel" is appropriate for them. And there are, no doubt, other approaches. what theosophical books and literature should I read and study? In light of this morass of claims and teachings, interested inquirers and new students of Theosophy would do well to read and study firsthand the original writings of H.P. 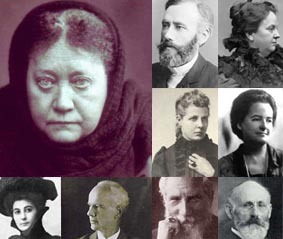 Blavatsky and her Masters. This original Theosophical literature includes H.P.B. 's 10,000 + pages of writings and the letters of H.P.B. 's Masters received during her lifetime. Some students would also include in this category the historical material relating to H.P.B. 's life, the Masters and the early Theosophical Society/Movement covering the years 1874 through 1891. These writings as described in the last paragraph contain a wealth of valuable material on Theosophy, metaphysics, esoteric lore/knowledge, occult laws/processes in nature, ethical, spiritual and devotional material, history (Theosophical and otherwise) and much more.  The Fountain Source of Modern Theosophy.  Madame Blavatsky's Occult Status and the Claims of Latter-Day Messengers of the Masters. (1) In Nov. 1894, Mr. Judge declared (based on what he claimed were the directions of Master M.) that Mrs. Besant was no longer joint outer head with him of the esoteric school. See Judge's Order of 1894. See also Mrs. Besant's reply to Mr. Judge's order.